Global Economic Surprises resume downwards, Euro CDS continue upwards, pressure on pro-risk continues in the absence of any notable policy responses. At the time of writing, Europe Friday morning, US stock indices have yet to take out their low of my ‘Capitulation’ post two weeks ago, but the low is at risk as the Dax has broken it. I maintain two scenarios, that share similarities with Jan’s. The one is that we fall into Monday’s full moon and thereafter a true rally emerges. Supporting that are the extremes that we currently see, such as RSIs sub 20 on crude oil and Euro-USD, insider buying and AAII sentiment at historic market bottom levels, public opinion the US dollar at a new record since 1999. A snapback rally is overdue. We also have potential basing patterns in US stock indices and gold. The second scenario is that the full moon, forecast geomagnetism and Puetz crash window keep the fear in overwheming mode and that we fall further over the next week or two, until we get to the more concrete action in terms of Greek elections, FOMC and Euro conferences later this month. I would be looking for a positive divergence in the Nymo on further falls. If we do fall further, in this second scenario, then some of the indicators are going to be at crazy extremes. Needless to say, I will be attacking any further downside, and maintain that these are glorious pro-risk opportunities here. First a chart on gold. Here is gold priced in Euros. 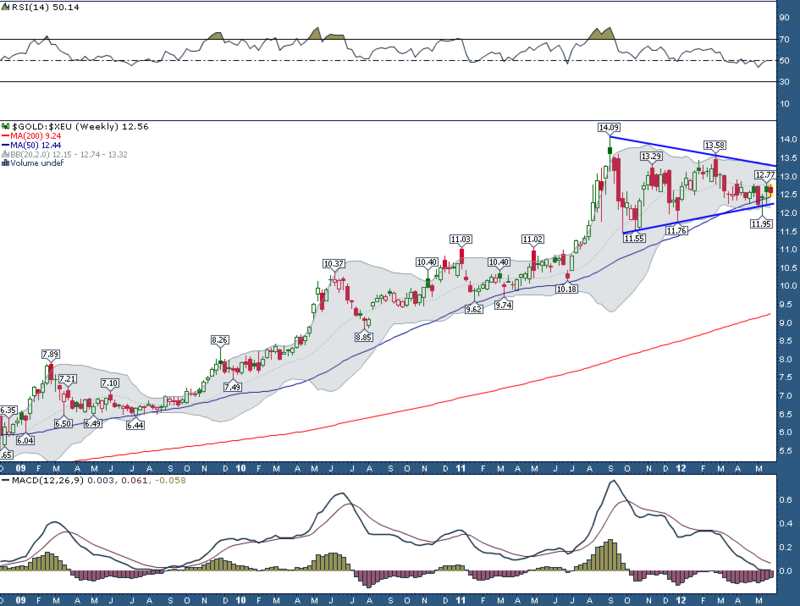 A more bullish chart than in US dollars, as it shows a pennant forming in an uptrend. The US dollar strength perhaps therefore accounts for why gold in its usual pricing looks technically dubious. 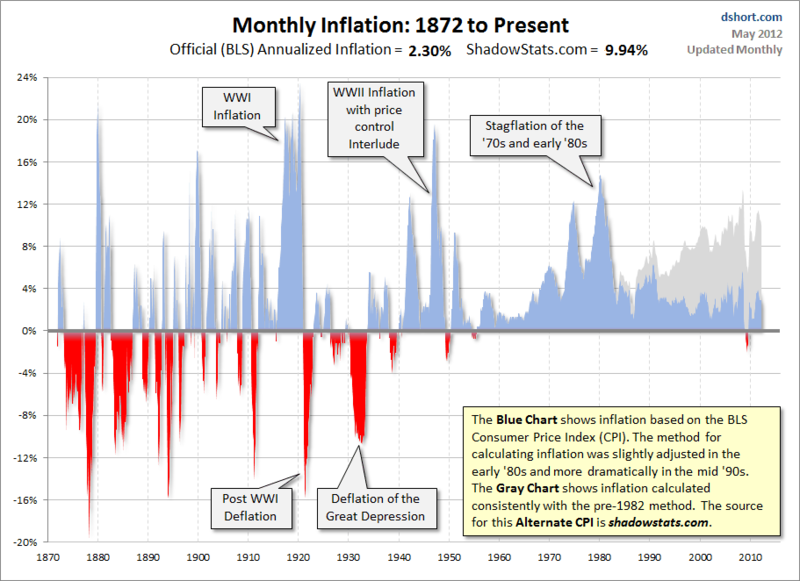 I remind you that we have historic paralells in the 1940s – inflation spike in 1942, then 5 years later higher inflation spike coinciding with solar and secular commodities peak – and in the 1970s – inflation spike in 1975 and then 5 years later a higher inflation spike coinciding with solar and secular commodities peak. In the current period we saw an inflation spike in 2008 and next year is 5 years later and the expected solar peak, and in my expectation, the secular commodities peak. So inflation should eat away at the p/es whilst stocks do OK in nominal terms. Japan by p/e is also back to its last secular bear market ending low. Most corners of the globe are represented further down the list, and it’s fulfilling, for me, to see the global reach. My most popular pages/posts, bar the obvious Home page, have been the Short and Medium Term Models and the Timetables, followed by the post on Solar Cycles and Astro Trading (I believe a principal reason for that is that Googling astro trading returns my page) and the Opportunities / More Opportunities posts of two weeks ago (I have noticed previously that when market action becomes panicky, more people stop by, no doubt looking deeper and wider than they normally would, to make sense of the falls and shore up their strategies). My old site, Amalgamator, has now been removed from the web. If there is anything from the old site that you miss or would like to see again, let me know, as I have a record of most entries and charts. I am not here next week. I am on holidays and will only have my phone to keep abreast of the markets. There will be no posts or model updates next week. Nice holidays, John. Key dates from yesterday to mid jun12 for a rebound, as I wrote in your sit many weeks ago. After the rebound in the Industrial, sp500, Russell, NDX, etc, target dow dec12-jan12 9.000 +-, or less. Tehe mayor rebound in 2013, the pick around summer, ago13. From St, Sebastian, north Spain. I have just added a chart to the above post showing Japan’s p/e, with a similar message: back to its last secular low. A well deserved “Century” John! Not sure how much sense it makes to compare PE to historical. Global wise, all central banks plugged un-imageable amount of money into system and took over so much debt to make sure economy does not go down to toilet. If put in historical picture, most of the companies should have disappeared to clear the system for the true bull market. PE might have been 30/40 without government support at current level. 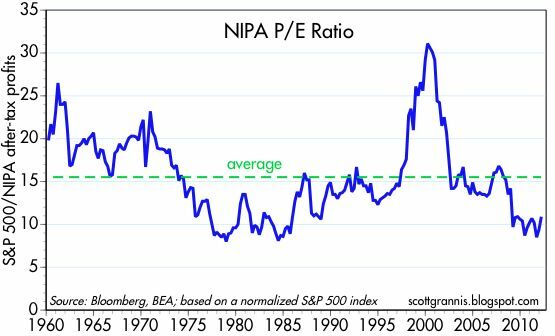 Looking at Japan’s PE after their bust, it went back to the start of its ‘bull’ market, but was that opportunity? 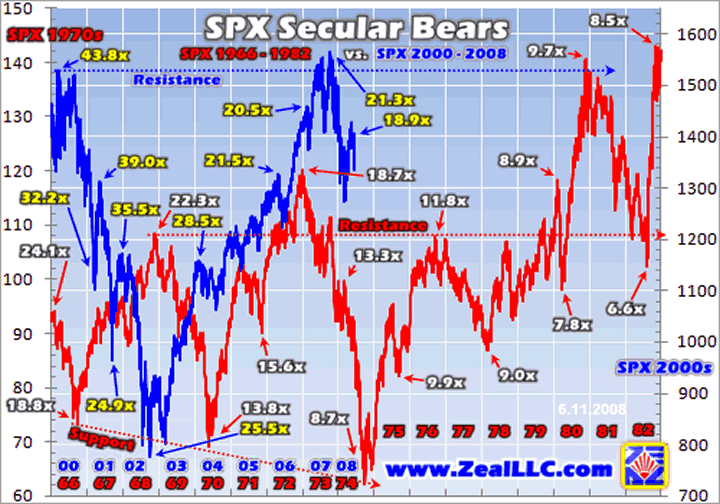 In terms of Astro cycle, major 19 year cycle peaked in March-May, pointed not-nice picture till early next year. Uranus square Pluto put huge negative in coming months. Would guess more pain on the way before opportunities take off. PM’s will be the early movers then stocks will follow. I don’t think we’ll tank next week. Instead I feel markets will bounce sooner than many may think on Ben’s hot air. Oh… keep up the good work. This site of your is incredible. If we finish today as we are then we would have the lower low on stocks with the Nymo positive divergence, plus a positive RSI divergence on the low 2 weeks ago. May has been remarkable month with powerful moves for all major asset classes. Risk got killed, safe havens moved up strongly. Sentiment is extremely over-stretched in either directions now. So from a contrarian point of view, we should still enter a period of “mean revision” (as John puts it well), where oversold risk assets bounce and overbought safe havens correct. Cheers Tiho – have added that to my new post, just published. p.s. Following the current rally from all risk assets, I think we will break down into a bear market. I also think there is a good chance Gold, even in Euros seen above, will break down and correct further. But for now, the shorter term trade should still be long, especially after Fridays strong action.